The current conversational content at my house breaks down pretty simply. It’s approximately 11% making fun of me for dying; 6% what’s for dinner; 43% cats, cat behavior, cat functions, and doing impersonations of the cats; 3% about enhancing verticality in theatre communities to better simulate a neural network of intelligence and talent (which is just me monologing after Megan goes to bed); and 37% about immersive theatre. Megan has been fascinated by immersives and their brethren since Punchdrunk infected her with Sleep No More years ago. Taking her love of video games and crossing them with her love of performance art seems like a pretty sure way of making sure she’s paying attention. Despite her love of immersives, travel to go see them, and meticulous deconstruction of their inner workings… she had never managed to get me to one. She did her damnedest to get me in to Third Rail Project’s Grand Paradise in New York when we were on my “sorry I moved you to Minnesota” Hamilton trip but they cancelled all shows the night we had tickets for so I still hadn’t seen an immersive theatre piece until last Sunday when we braved the snow to get out to CHS Field in St. Paul to see Mixed Blood Theatre’s Safe at Home. Of course my first piece of immersive theatre is going to be about baseball, it’s like they wrote a play specifically FOR me. Well, except that Safe at Home wasn’t really an immersive piece of theatre. In the 37% of our conversations devoted to immersive theatre and its kin Megan and I have talked a lot about the slipperiness of terminology used to envelop non-proscenium theatre. Companies often apply the term “immersive” as a marketing term to work that is in any way divergent from call and no-response butts-in-seats theatre. That’s not specific enough to be of real use. I hereby define immersive in my usage to only refer to theatre that gives the audience agency in either the telling or plotting of the story. I can’t say whether or not this is Megan’s definition today, but I can say that I’ve stolen it whole hog from our discussions. Safe at Home was a site specific promenade show. It wasn’t immersive. The audience had no defined role in the show either as a force on the performers or the story, no interaction was required (or permitted) and the show would have unspooled the same no matter who was in the audience or indeed if there was no audience. None of which is meant to imply that the 9 scenes weren’t excellent. The inning structure and the variance in scenes from deeply involved with plot to 7th inning mascot performance art was smart and well done, and the performances were very good. 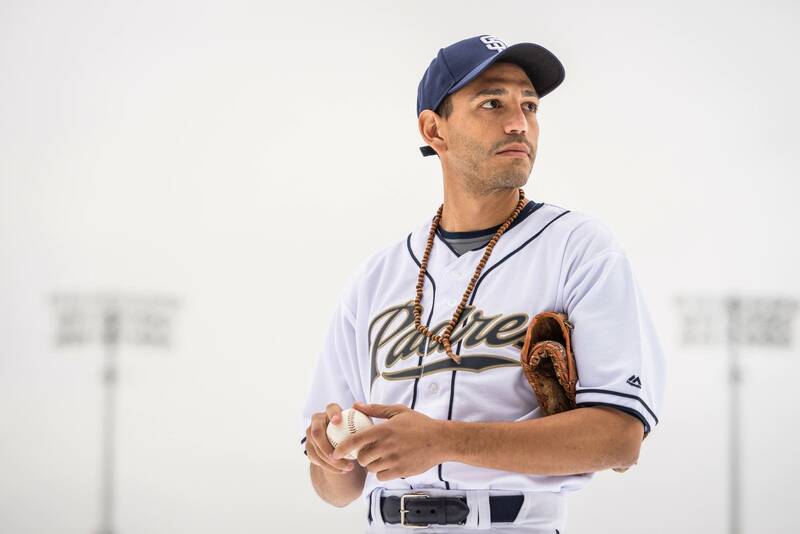 The plot revolves around the choice the star pitcher of the San Diego Padres faces heading into his start in Game 7 of the World Series: whether to leverage this moment to make an important political stand or keep his head down and cash in on a best of all possible worlds free agent season. The argument is well drawn for both sides of the issue and the back and forth is one very familiar for those who’ve spent anytime near the sport. The press vilification of a talent selfishly putting it all together just in time to get paid. The “attitude problem” of anyone not giving the classic Crash Davis press conference. But the tropes are well used here to discuss very current issues. The production was designed to be experienced in staggered groups of 20 or so led through the infrastructure of CHS Field, moving from press room to offices to concessions prep room to batting cage to men’s rest room to locker room to eventually (on a non-snowy day) the dugout. The experience embarked from the suite along the first baseline where we were greeted by our tour guide and given some exposition off note cards before moving to the press box for the first in-show scene. The biggest hurdle in form for any promenade show is the interstitial moments. In the same way bad scene changes can kill a proscenium show, the moments between the scripted performances can spike a promenade. For a seamless experience the interstitials need to sustain or even feed the pace and emotion of the beats we’re entering or leaving so that we don’t get emotionally shorted out of the scene we just saw or stub our (mental) toes headed into the scene about to begin. You choose via design whether you’re going to attempt to control those moments environmentally (“sandbox”) or via more hands on control creating an “on rails” experience. Mixed Blood chose to do this via the tour guides. For a rails experience like Safe at Home to be one hundred percent successful the interstitial actors need to be as invested and in-the-moment as the plot actors. They are tasked with creating the walls of the world we are being guided through and any wavering in the storytelling will bring the walls crashing down around us. I only saw the show once and so hesitate to blame our specific tour guide as I don’t know how they performed the task set before them versus how the task was designed, but the walls of this alternate baseball world were never better than shaky and disappeared about halfway through leaving the scenes as pearls on a string rather than special glimpses into a richer world. The first inning was the rockiest, as first innings often are both for players and fans. On the diamond the players don’t have a game rhythm yet and the fans haven’t settled into their seats or are still wrangling food and drink. For this show the rules of engagement hadn’t been well set before we began and the written structure of the scene is such that the performer was forced to rely on the high school audition monologue technique of pausing to pretend hear the reporters’ questions in the pre-game press conference. There’s a reason the technique is frowned upon… there’s no way for it to not seem extremely mannered. There is simply no way to execute what is entirely an acting exercise in a non-actor-y way. Despite the warmth of the performer the absence of the reporters left an air of awkwardness when combined with the unsettled rules and the very intimate space in the Saints press box at CHS Field. The experience then had the group exit the world of the play via our guide, to make our way to the next playing space via a concourse which was filled with electronic music. The music was an odd design choice in lieu of traditional baseball music (i.e. organ music), modern baseball music (i.e. classic rock, Sweet Caroline), or creating World Series Game 7 atmospherics with ersatz radio highlights of the classic Padres season we were at the conclusion of. This was the pattern of all nine innings, strong scripted scenes punctuated with an unanswered question followed by world scrubbing. My issues with the user interface of this particular performance aside, the world of the play was incredibly rich and I had a really good time. It’s never going to be a bad night for me when you throw live performance, baseball and the West Wing in a blender. There were six “plot” scenes and three other scenes from the world of the play (stadium workers on the racial hierarchies in their microverse, fans on the the limits of fandom in a real world, and the aforementioned performance art piece featuring Not-the-Swinging-Friar and Not-the-San-Diego-Chicken) which left the company very little ground to cover a lot of plot territory. I wanted to revisit several of the characters and to get more depth than the seven minute innings allowed for. I regard that as a huge positive. Different forms of theatre require different skill sets. This sort of site specific work requires more than expertly faceting the gems of performance, they have to be set and framed just as exquisitely or the experience remains flawed. My experience pointed to a company being world class at the things it does well and missing opportunities in the areas that are outside their wheelhouse. Safe at Home is the sort of piece that is ripe for partnership with artists that specialize in the sort of first person rails experience Mixed Blood was hoping to deliver. Whether that might be an indie immersive company or even a game company, that little bit of help in polishing the edges of the user experience framing such a well told story would have been perfection.